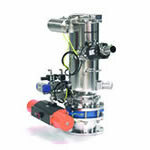 Prove the viability of pneumatic conveying for your application in our 750 sq. ft dedicated test facility where we have the ability to test all sizes of vacuum conveyors, and all but the very largest vacuum pumps, in house. Not all browsers support interactive PDF forms, and you appear to be using one (Firefox). For best results, either use a different browser to retrieve this form, or right click on the ‘form’ link, save the form to your hard drive, complete within your system environment and then email as suggested.